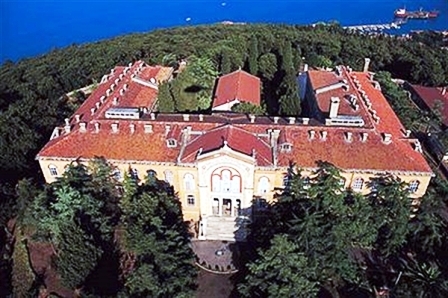 In 1971, the Turkish government closed the Halki seminary (Heybeliada), the oldest and most important religious education institution in the Christian Orthodox Church, creating a grave crisis. This followed earlier Turkish Government decrees affecting the Patriarchate including a requirement that the Patriarch must be a Turkish citizen and that the Turkish Government can veto the election of a new Patriarch. 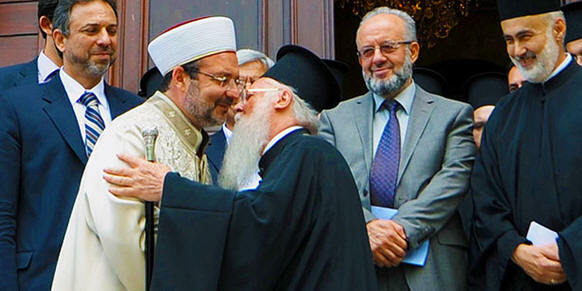 Previous Turkish Governments had objected to the Ecumenical Patriarch of Constantinople exercising his rights as the spiritual leader of more than 300 million Christian Orthodox faithful (the second largest Christian denomination in the world), tried to restrict him to the leadership for only the tiny Orthodox community in Turkey and confiscated Church properties in Turkey. This was a reversal of several centuries of much greater tolerance. Although Turkey is an Islamic country, the government closed all all Muslim schools as well in an effort to secularize the school system. As the only Christian Orthodox seminary in Turkey Halki was closed as collateral damage. 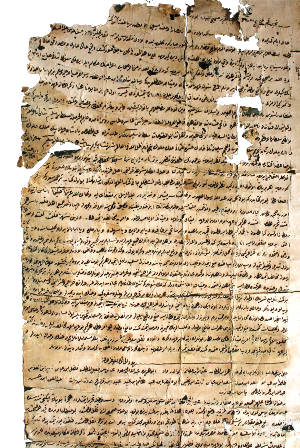 May 2012, Pave the Way Foundation sent 5 letters to the Turkish government containing a Muslim request for Halki' s reopening together with its religious justification. 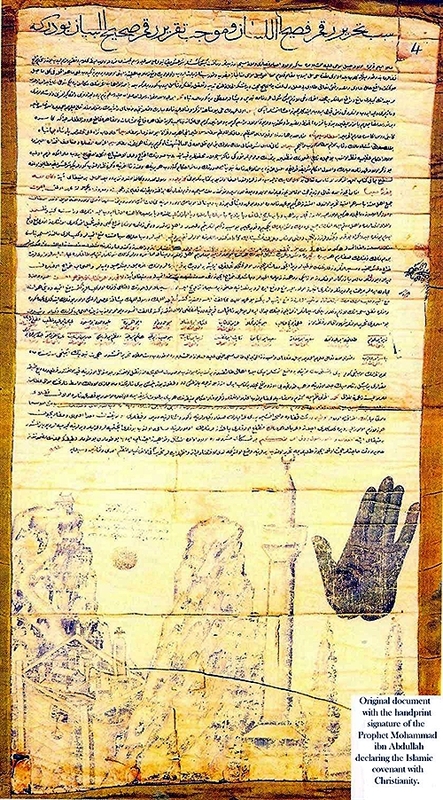 The request is based on a covenant of protection for the "people of the book" (a term used to describe Jews and Christians) guaranteed by the hand-printed signature of the Prophet Muhammad in 628 AD. The Prophet Muhammed, through his covenant, guarantees Islamic protection of the Christians and their churches from all of his followers until the end of time. "As the Religious Affairs Directorate, we see non-Muslim citizens living in Turkey as an integral part of this country. Regarding religious freedoms -- freedom of religion, freedom to receive an education and the sacredness of places of worship -- we demand for them the same rights that we demand for ourselves. We think it is a fundamental right for people from every ethnicity and religion not only in our country but also in every part of the world to practice their religion freely, educate their children in accordance with their beliefs and raise their own theologians,"
Pave the Way Foundation is proud of the role we played in this advance towards religious tolerance "paving the way" to improved relations. We are honored that our Muslim partners have trusted us and have participated in this initiative. We all collectively look forward for the opening of the Greek Orthodox Halki (Heybeliada) Seminary, which will show the world that the Turkish government is truly interested in religious tolerance. In 628 CE, a delegation from St. Catherine's Monastery came to Prophet Muhammed and requested his protection. "This is a message from Muhammad ibn Abdullah, as a covenant to those who adopt Christianity, near and far, we are with them. Verily I, the servants, the helpers, and my followers defend them, because Christians are my citizens; and by God! I hold out against anything that displeases them. No compulsion is to be on them. Neither are their judges to be removed from their jobs nor their monks from their monasteries. No one is to destroy a house of their religion, to damage it, or to carry anything from it to the Muslims' houses. Should anyone take any of these, he would spoil God's covenant and disobey His Prophet. Verily, they are my allies and have my secure charter against all that they hate. No one is to force them to travel or to oblige them to fight. The Muslims are to fight for them. If a female Christian is married to a Muslim, it is not to take place without her approval. She is not to be prevented from visiting her church to pray. Their churches are to be respected. They are neither to be prevented from repairing them nor the sacredness of their covenants. No one of the nation (Muslims) is to disobey the covenant till the Last Day (end of the world)." 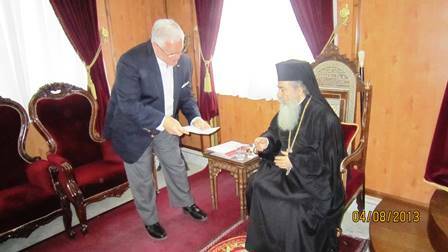 Below, Gary Krupp updates His Beatitude Theophilos III, Greek Orthodox Patriarch of Jerusalem, of our effort to reopen Halki. It was Theophilos who first alerted us to this obstacle between the Greek Patriarchate of Constantinople and the Turkish government. With the intercession of His Beatitude, Theophilos III PTWF, was able to obtain two more manuscripts reaffirming Muhammad order to protect the Christians and their Church until the end of days. Special gratitude to Dr. Nicholas Fyssas Supervisor of the Sinaitic Archive of Monuments Mount Sinai Foundation. Σαρηγιάννης –Σπυρόπουλος, «Το Οθωμανικό Αρχείο» (ανάλυση της βραχυγραφίας κατωτέρω), Έγγραφο υπ.αρ. 34, σσ. 95 και 348 (πιν. 118). Μαρίνος Σαρηγιάννης – Γιάννης Σπυρόπουλος, «Το Οθωμανικό Αρχείο του Σιναϊτικού Μετοχιού του Αγίου Ματθαίου στο Ηράκλειο Κρήτης (1573-1849», στο Σιναϊτικά Μετόχια σε Κρήτη και Κύπρο, εκδ. Ίδρυμα Όρους Σινά / Σιναϊτικό Αρχείο Μνημείων, Αθήνα, χ.χ., σσ. 71-95, 344-348 (πιν. 109-118). 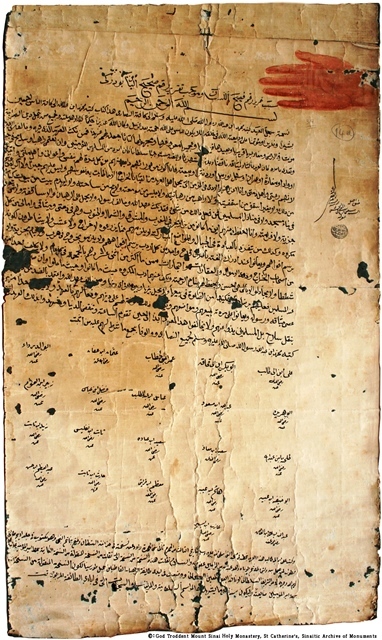 "Ottoman Archive of Sinai Monastery of St. Matthew in Heraklion Crete (1573-1849", in Sinai dependencies in Crete and Cyprus, ed. Institute Mount Sinai/Sinai archive of monuments, Athens, ch.ch., pp. 71-95, 344-348 (Pini. 109-118).